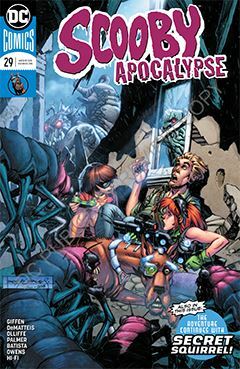 Months ago, it was believed Fred Jones died in battle against the monsters unleashed upon the post-apocalyptic world. Last issue, we learned Fred – or some form of him – is alive and, well, maybe not well. He’s not a creature like the ones they’ve been fighting for almost 30 issues, but he is certainly not human anymore. Zombie? Perhaps. Now, Velma and Shaggy are receiving reports of sightings, and they are in no rush to inform Daphne. She’s been working out her grief by taking the battle to the monsters, and with the help of Scrappy Doo, it seems to be working out for those concerned. But sooner or later, she’s bound to run into Not Dead Fred. I’m curious to see how the creative team handles that; hopefully with some originality. I’ve been reading this series since issue #8, and I can honestly say I never thought we would make it to #30. I assumed a mildly curious audience would eventually lose interest, and/or the creative team would run out of ways to keep the book fresh. Kudos to them for giving this concept legs. Though I do hope this is a one-off. I can see where DC Editorial might begin looking at re-inventing other Hanna-Barbera properties (because Secret Squirrel was SO successful). This issue sees the long overdue conclusion of Secret Squirrel. It out-lived its premise. It’s been a long time coming, very much like an SNL skit someone tried to turn into a movie. I am hopeful its lackluster performance will lay the “Let’s reinvent the H-B characters” startegy to rest indefinitely.